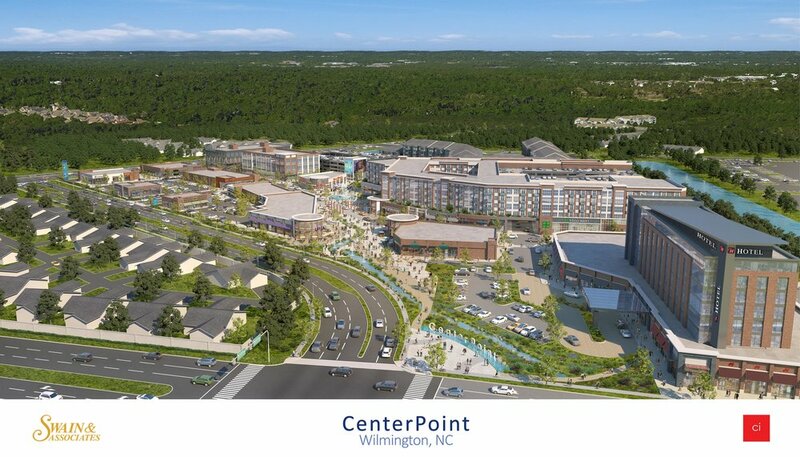 The Wilmington City Council approved two new mixed-use developments on Tuesday night, including a large Mayfaire-like project called CenterPoint that would be located on Eastwood Road. The first approved by the board is a three-story building containing 3,240 sq. feet each for retail and office space as well as three one-bedroom apartment units. The development, called Trolley Station, will be located on about an acre of land at 6789 Wrightsville Ave. at the intersection with Jones Road. While there were concerns by neighbors about buffer zones and flooding (Jones Road is only currently partially paved and prone to high water levels during storms), the project was eventually approved by a 5 – 2 vote, with Councilmen Charlie Rivenbark and Paul Lawler dissenting. Conditions for approval include a 20-foot buffer for the 45-foot building on the property line with the adjacent MacCumber Terrace residential community as well as a bus pullout west of the development’s proposed Wrightsville Avenue pullout to increase accessibility to public transportation. Trolley Station’s size of 9,800 total sq. feet of mixed-use space pales in comparison to the other development approved for a lot just a mile away. According to the proposal plans, CenterPoint will have 300 apartments, a 200-room hotel, 127,939 sq. feet of retail space, 55,461 sq. feet of restaurant space, 75,000 sq. feet of medical office space, and 31,600 sq. feet of general office space. It will also include two multi-level parking decks as well as street-level spots for a total of 1810 parking spaces. The project will be developed on a 24.81-acre site located at 1531 and 1541 Eastwood Rd. between the Eastport residential subdivision and Cambridge Village retirement community. An extension of Drysdale Road will be built on the Eastport side of the development by the North Carolina Department of Transportation as part of the proposed changes to the Eastwood Road/Military Cutoff intersection. David Swain of Swain & Associates was chosen by the current property owners, the Wetherill family, to purchase and develop the land. Swain created The Forum shopping center on Military Cutoff Road, among other projects. Swain is bringing in CI Design of Baltimore to design the project, as well local architect Bruce Bowman of Bowman Murray Hemingway Architects and civil engineer Richard Collier of local firm McKim & Creed. Bowman and Collier, who both spoke before city council Tuesday night, serve on the City of Wilmington’s planning board, which approved the CenterPoint development at one of its recent meetings. Wrightsville Beach Alderman Ken Dull also spoke during the public hearing portion in favor of the development. While traffic issues have been brought up at previous meetings, only one resident Tuesday night spoke against the project. Both the request for rezoning to allow for the project as well as a special use permit to increase the buildings’ height to 75 feet maximum passed city council unanimously.